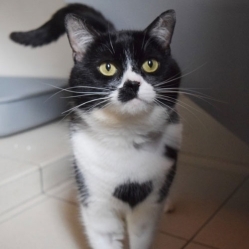 Ronnie is a social but independent cat who took a little while to completely settle into the cattery. Once new owners win him over with his favourite foods, Ronnie's sweet and affectionate nature will shine through, rewarding owners for their patience with his love and lap time. Ronnie much prefers interactions on his own terms so new owners should respect this and give him the space to go about his pleasures. Ronnie will require a full time cat flap in his new home to provide him with full choice and control allowing him to come and go as he pleases on all his exciting adventures!